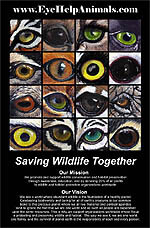 EyeHelpAnimals.com has created our exclusive Saving Wildlife Together Wildlife Eyes Poster to help spread our message of wildlife conservation and habitat preservation. You can let others know that you care about saving wildlife and preserving habitat by hanging this poster for all to see. Remember — 25% of the profit on all of our items goes directly to saving wildlife by supporting wildlife conservation and habitat preservation organizations around the globe.